The Colonial Athletic Association Men’s Basketball Championships are heading south starting next year, moving from Royal Farms Arena in Baltimore to North Charleston Coliseum outside of Charleston, S.C., according to a Jan. 28 press conference. 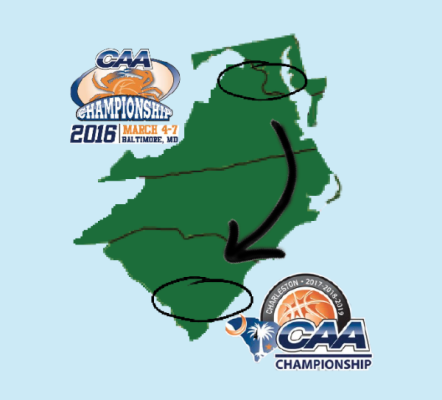 Baltimore has played host to the CAA men’s tournament since March 2014. For 2017, 2018 and 2019, the event moves to the warmer, more tourist-friendly area of Charleston, less than 10 miles from the College of Charleston. The Cougars do not play at the North Charleston Coliseum for their home games (they play at TD Arena, on campus), but are technically playing host for the next three years. This is a shift from the past few years, in which the tournament has taken place at a true neutral site in Baltimore and a semi-neutral site at the Richmond Coliseum from 1990-2013. The location in Richmond eventually became truly neutral after Virginia Commonwealth stopped using it as the team’s home court in 1999, the Richmond Spiders left the CAA in 2001, and VCU left the conference in 2012. The vote and contract deals have been in the works for several months, as the current agreement between Royal Farms Arena and the CAA ends after this year’s tournament. The venue is about the same size, with a capacity of 11,000 compared to 11,271 in Baltimore. Charleston has only been a CAA member since the 2013-2014 season, but as the southernmost program in the conference, it is an attractive location to select as host due to the warmth many teams wouldn’t enjoy at home in early March. Its status as a tourist destination doesn’t hurt either. The journey will be a bit longer for William and Mary at 437 miles to the Coliseum from Kaplan arena rather than just 197 miles to Baltimore. The Tribe looks to make its third consecutive finals appearance in the Championships after falling to Delaware in 2014 and Northeastern last season. This last run to Royal Farms Arena goes from March 4-7 during the College’s spring break. Charleston is one of the great places in the nation to visit and I am confident visiting fans throughout the CAA will have a terrific time here,” College of Charleston Athletics Director Joe Hull said. “Charleston is one of the great places in the nation to visit and I am confident visiting fans throughout the CAA will have a terrific time here,” College of Charleston Athletics Director Joe Hull said. The next day, an announcement was also made about the future of the CAA Women’s Baksetball Championships. The change in locations is a bit different, as three on-campus sites were announced rather than a neutral location. Currently the championships are held at the Show Place Arena in Upper Marlboro, Md. The CAA has used the location since the 2011 tournament after switching campus sites every two years for most of women’s basketball’s 32-year history in the conference. James Madison will be the first to host, hosting in 2017. Drexel will host in 2018, while Delaware’s campus will be the site of the 2019 Championships. The reversion to on-campus sites was based on attempting to craft better fan experiences, as stated by Yeager. The Show Place Arena holds 5,500 spectators, while the JMU Convocation Center has a capacity of 6,426, the Daskalakis Athletic Center (home of the Drexel Dragons) holds 2,532, and the Bob Carpenter Center at Delaware seats 5,000. The College’s women’s basketball team travels to Upper Marlboro for the final time March 9-12 for the conference tournament. Senior Staff Writer Nick Cipolla '17 is a neuroscience major from Virginia Beach, Va. He was previously Sports Editor.